Season 20 of Top Gear returns this Sunday in all its epic glory. Check out the trailer below to see what to expect. It’s hard to believe, but the British motor show Top Gear will kick off its 20th season this Sunday, June 30. In lieu of its highly anticipated premiere, the folks over at Top Gear have decided to tease fans with an exciting 30-second trailer. So what does Season 20 of Top Gear have in store for viewers? Based the preview, car enthusiasts can expect to see presenters Jeremy Clarkson, Richard Hammond and James may behind the wheel of a diverse selection of vehicles – including a brand new 730 horsepower Ferrari F12 Berlinetta, an old white limousine, and an America’s Cup yacht. Not surprisingly, the trailer also includes comedic moments such as when Clarkson and May dump The Stig into a garbage bin. For those of you who unfamiliar with the show, The Stig is a character that appears in a full-face helmet and racing suit, who is tasked with setting lap times and instructing celebrity guests. The running joke is that nobody knows who, or what, is inside the suit. Although the identity of the current Stig remains a secret, former Stigs have included race car drivers Perry McCarthy, Michael Schumacher and Ben Collins. According to an overview provided by BBC America, episode one will feature Clarkson and May racing a car against a state-of-the-art America’s Cup yacht, and Hammond testing out three new hatchbacks: the Renaultsport Clio 200, Peugeot 208 GTI and Ford Fiesta ST. Sunday’s show will also include stars like actor Warwick Davis, Game of Thrones star Charles Dance and R&B singer Joss Stone. A newly added photo gallery on BBC’s Top Gear page sheds further light on other vehicles we can look for over the course of this season. 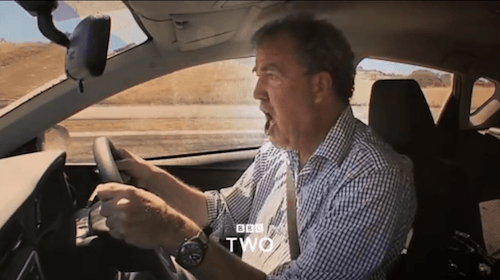 One still shot shows Clarkson driving a BAC Mono, which is a 280 horsepower Formula 3-inspired rocket, while another showcases the impressive Mercedes SLS AMG Black Series coupe. To top it off, Clarkson will get behind the wheel of the Jaguar F-Type and new Range Rover Sport – perhaps the best of what the British car industry has to offer. From its humble beginnings as a conventional motor magazine show in 1977, Top Gear is currently the most-watched factual television program in the world. Since being re-tooled and re-launched in 2002, it has received praise for its presentation and visual approach, and criticism for the political incorrectness of its hosts. The show brings in an estimated 350 million views per week in 170 countries. The season premiere of Top Gear airs on Sunday, June 30 on BBC Two and BBC HD. The same episode will debut on BBC America on Monday, July 8. This season features six episodes.